Looking upriver on the Colorado River at Horseshoe Bend. This section of river is the only place between Grizzly Creek and Two Rivers Park where the river is away from I-70, making it popular with both boaters and bighorn sheep. 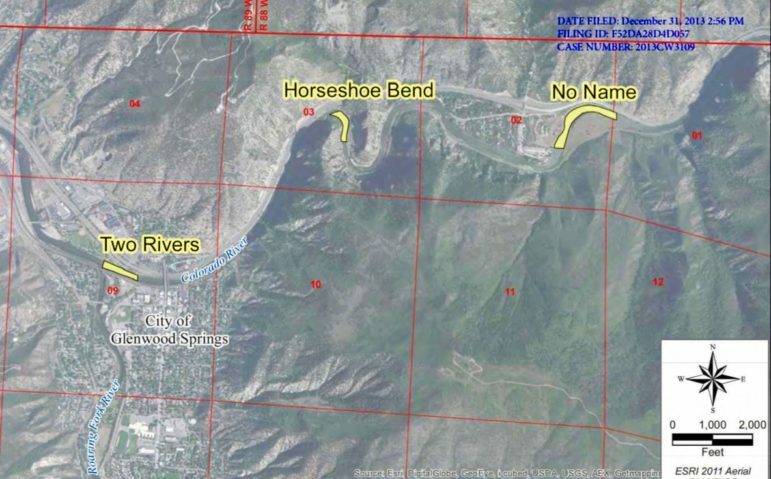 FORT COLLINS – The city of Glenwood Springs has reached an agreement with Colorado Parks and Wildlife to prioritize the Two Rivers Park and No Name locations over the Horseshoe Bend location in its ongoing quest to secure water rights for the three potential whitewater parks on the Colorado River. The city’s agreement with CPW, reached March 18, means if the city someday moves forward and installs concrete wave-producing forms in the Colorado, it probably won’t happen at Horseshoe Bend, where the river is shielded from Interstate 70 by a short tunnel, a steep ridge and a tight turn in the river. “This section of the Colorado River has a significant resident bighorn sheep population that is already impacted by human activities such as highway development and boat traffic,” the Colorado Water Conservation Board said in findings it made last week about the city’s proposal, citing the opinion of CPW staff about the Horseshoe Bend location. While meeting Thursday in Fort Collins, the directors of the CWCB voted unanimously to approve required findings regarding Glenwood Springs’ proposed water rights, known as a recreational in-channel diversion right, or RICD. The CWCB board found in 2015 that the city’s proposal did not meet its requirements, and voted against it 8-to-1, but reductions in the size of the city’s proposed water right and recent agreement with CPW were enough to gain the full board’s recent approval. The city did not want to give up on the Horseshoe Bend site entirely, however, as the Two Rivers Park and No Name sites have complicated land-ownership issues, and the city owns property at the Horseshoe Bend site on both sides of the river, according to Mark Hamilton of Holland and Hart, a water attorney for the city. The city’s property line is just downstream from land owned by the Bureau of Land Management at Horseshoe Bend. The BLM maintains a picnic shelter along a bike path at the site. The city filed an application with Division 5 water court in 2013 for the RICD water rights, which are tied to the construction of two wave-producing structures embedded in the river in each of the three potential locations. In order to finish the process of establishing the recreational water rights, the city still needs to finalize agreements with a list of opposing parties in water court. A view looking up the Colorado River from the pedestrian bridge over the river, just upstream of the river’s confluence with the Roaring Fork River. 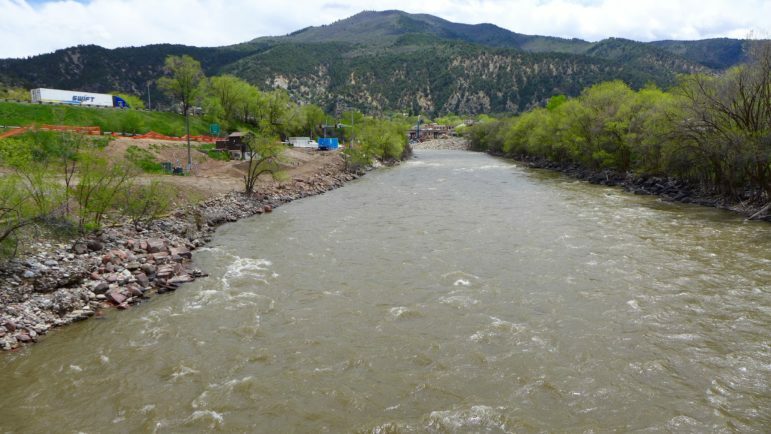 The location is one of three potential locations where the City of Glenwood Springs plans to build, someday, a whitewater park with two play waves. Hamilton said the city has yet to put forward a timeline to construct the whitewater parks in any of the three locations. Hamilton also couldn’t say whether the city would prioritize the Two Rivers site over the No Name site. “They both have advantages and disadvantages, and constraints and opportunities, so I would defer to City Council on that,” he said. 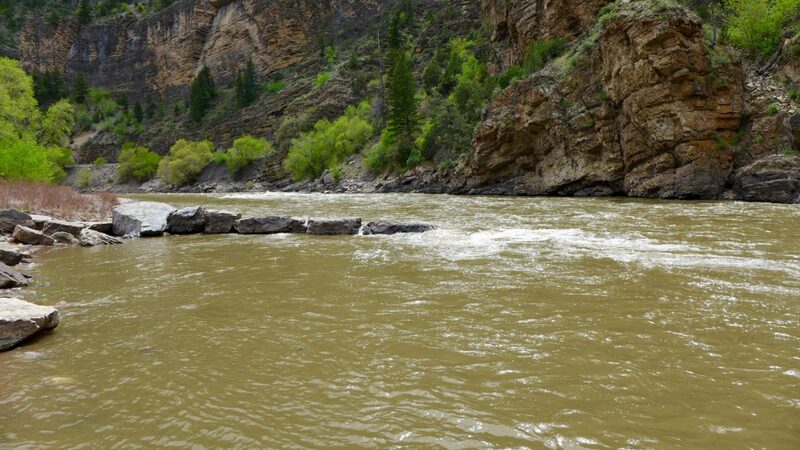 CPW also has concerns about the high flows — as many as 4,000 cubic feet per second — that the city wants the right to call for during a five-day period around the Fourth of July in order to hold whitewater competitions. “In CPW’s view, any substantial changes in wetted habitat due to artificial flow fluctuations could … flush fish of all ages down river or strand them in dry or undesirable habitat that could lead to fish kills,” the CWCB’s findings said. Given that, CPW is asking that the city not cause the river to rise or fall more than 500 cfs in a 12-hour period. The city’s proposed water rights, which are the same for each of the three potential whitewater-park locations, would be in effect from April 1 to Sept. 30 each year. The water rights, which would carry a priority date of 2013, allow for at least a flow 1,250 cfs during that period, which is the same level of flow that the Shoshone hydropower plant can call for. The plant is located on the river above all three proposed whitewater-park locations, and its senior water right has a priority date of 1902. As such, the city’s recreational water rights would serve as something of a backup to the rights tied to the Shoshone plant. The city also wants to call for 2,500 cfs of water to come down the river for 46 days, from June 8 to July 23, but has now agreed to modify its proposed water right to allow for a level of future upstream diversions to take priority over its 2013 water right. Editor’s note: Aspen Journalism covers rivers and water in collaboration with The Aspen Times, the Glenwood Springs Post Independent, the Vail Daily, the Summit Daily, and the Steamboat Pilot. The Times and the Post Independent published this story online on Monday, March 25 and in print on Tuesday, March 26, 2019.